Harvest time is sweet for any farmer, and particularly for church goers across the globe who see it as a time to give thanks for nature’s bounty of plenty. 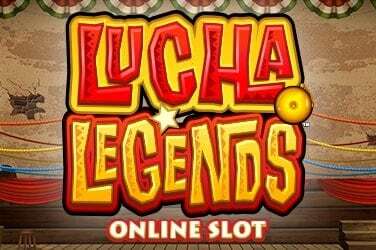 In the church of online gaming, Microgaming is a popular pastor whose sermons ring loud and clear and we seek bounty a-plenty of our own. Take a pew, for the Sweet Harvest’s doors are open. 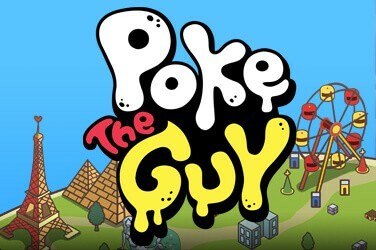 As you’d expect from a farming-themed bonanza, the base game is bright and light and full of the bounty of the fields. Plus some good-looking farm hands with their shirts open. 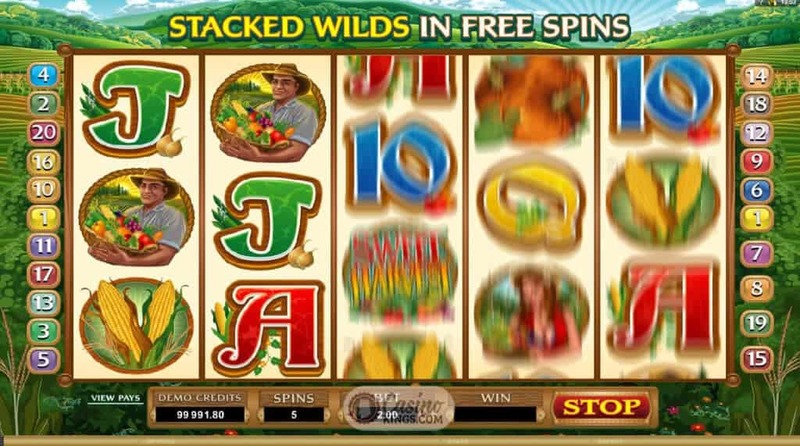 If it wasn’t hot it is now in this five reel, 20 payline outing from Microgaming. Couple these buff and beautiful country folk with the toe-tapping soundtrack and we’re singing “Yee-ha!” even before we score any big wins. 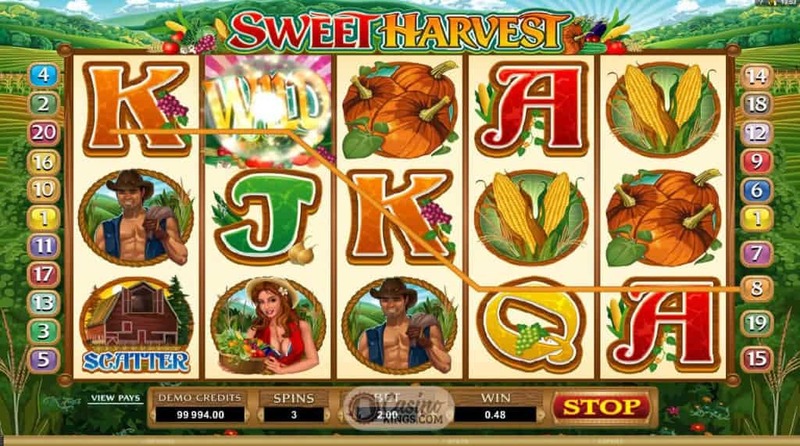 While pumpkins and corn are the nature’s fruits that feature prominently as symbols (our sweating yet perfectly coiffured Farm Hands are naturally the game’s high symbols), the game’s low symbols are the regular 10s through Aces. Given the sweetness of this harvest, couldn’t we have been treated with some other bounty from the fields? 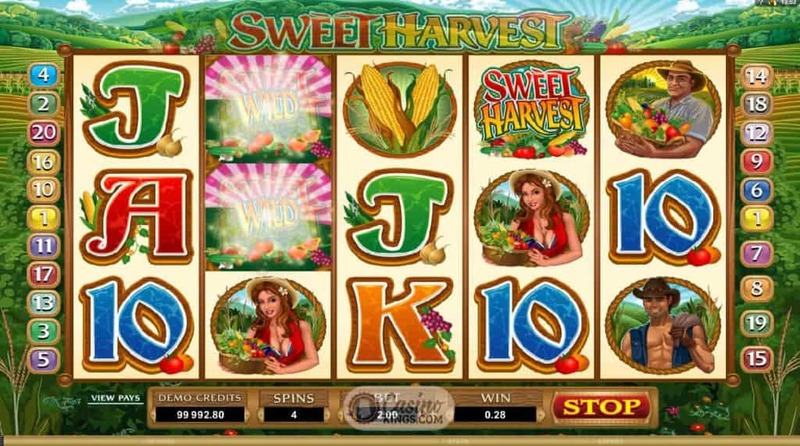 Nevertheless, this doesn’t detract from the gameplay and the Game Logo Wild’s substitution for all symbols except Scatters, which helps to bring in our very own harvest of winnings. 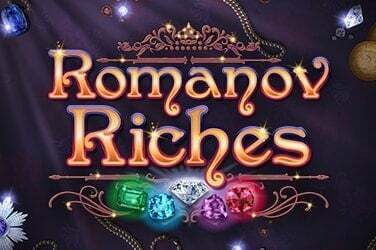 Three or more Ranch Scatters launches the game’s main bonus feature – 12 Free Spins – in which our two young, attractive and barely-dressed farm hands are also Wilds. No surprise that they may be stacked, given the mischievous looks on their faces. When both of these symbols are adjacent to each other on a winning payline during the bonus feature we are also treated to an extra 2x multiplier, so there’s a lot of country folk coupling up going on. 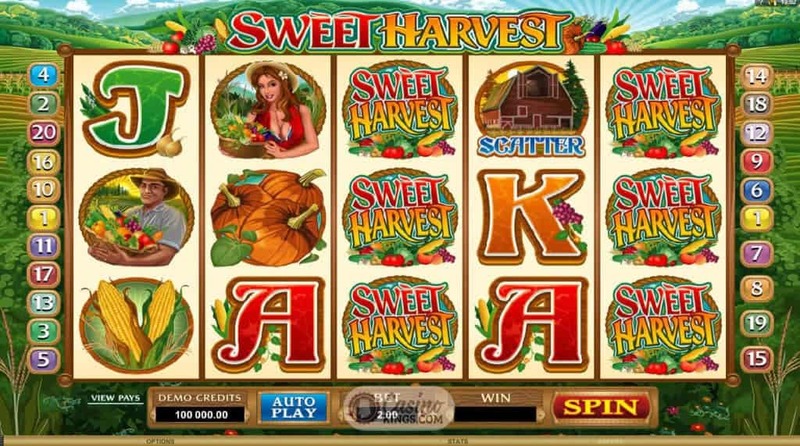 While we may often narrowly miss out on a free spins feature during a regular base game, Sweet Harvest gives us greater opportunity when our Ranch Scatter lands on reels 1 and 2. 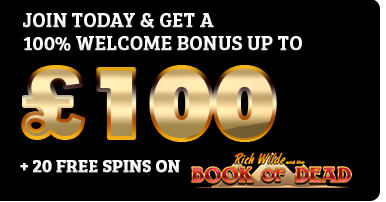 The game then automatically re-spins the remaining three reels, giving us another chance to launch into the free spins feature, which can also be re-triggered during the bonus game. Dolly Parton famously said that it cost a lot to look that cheap. 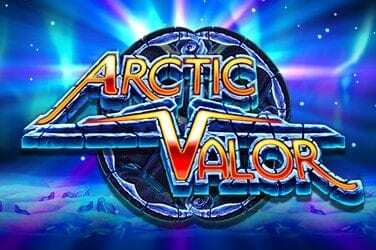 I don’t know how much Microgaming have spent on the development of this country-adventure, but it certainly doesn’t look or sound cheap. Add to that a few barely-dressed farmers and a country riff that Dolly herself would have been proud of and we have found ourselves a rubber neckin’ winner.